Okay, let’s be honest with each other. Nothing represents the essence of tropical better than a cocktail. Whether it’s at the beach, in your hotel room, or at some bar . . . your vacation is not complete without first enjoying a delicious, refreshing, tropical-hued cocktail—with or without the umbrella. 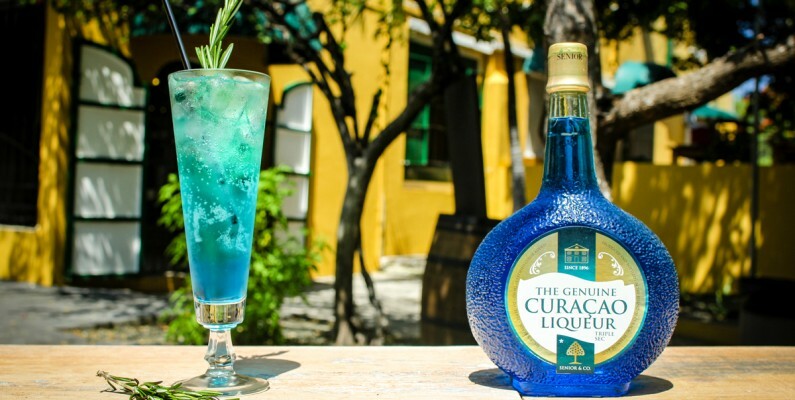 So as Home of Genuine Curaçao Liqueur and avid cocktail aficionados we gather for you the best cocktail bars on Curaçao. This list of the best cocktail bars on Curaçao won’t serve you the average Caribbean cocktail that you’ve seen everywhere. But, instead, you get a delicious carefully curated cocktail made with passion and with the island in mind. Mid-July we had the delight of experiencing the soft-opening of The Blue Experience Café. In honor of the sail-event, Velas Latinoámerica, they opened their doors to give people a sneak peek of what they can expect in the future. With a rustic industrial design, at the Handelskade overlooking the Sint Anna Bay, you’ll find this new cocktail bar. All their cocktails are made with Senior Genuine (Curaçao) Liqueurs holding the authentic taste of one of the island's best local products. Even though this bar will officially open on the 6th of August, we still had to include it in our list of the best cocktail bars of Curaçao. Get a tour, get a drink! At Landhuis Chobolobo you can participate in a guided tour through the distillery of the Genuine Curaçao Liqueur. You’ll learn about the history of the liqueur and its production, but the best way to really learn about the liqueurs is to taste it. That’s why after your tour through the distillery you will also get to taste a sample of our liqueurs and you will also get to choose your own cocktail based on your favorite liqueur at our cocktail bar. In the historic Pietermaai, you’ll find the trendy Luke’s cocktail bar. The cocktails are as trendy as the interior with an amazing combination of flavors. Their cocktail will delight every palette. Whether, you're into sweet, sour or fresh. You’ll find something you like at Luke’s. Perhaps not exactly a cocktail bar but more a restaurant, Kóme serves wonderful cocktails to pair with your food nonetheless. Also situated in the historic Pietermaai this restaurant offers you a variety of cocktails made by their skilled bartenders. They have an array of liquor and liqueurs, including our Senior’s Tamarind Liqueur, so there is something for everyone. Ask them to create something beautiful with the Senior’s Tamarind Liqueur. Their creation might pleasantly surprise you.